This is another offering from Honestly Healthy for Life. Freya made this one as I was feeling poorly and she insisted I sit down and rest while she did the cooking. I really can’t go on about Quinoa enough. It’s so versatile and takes on the flavours of any liquid you cook it in. This recipe is no exception. Most of the dishes in this book cook the quinoa in bouillon. We eat a lot of roasted beetroot – so I was glad to see a few beetroot dishes in the Honestly Healthy book. 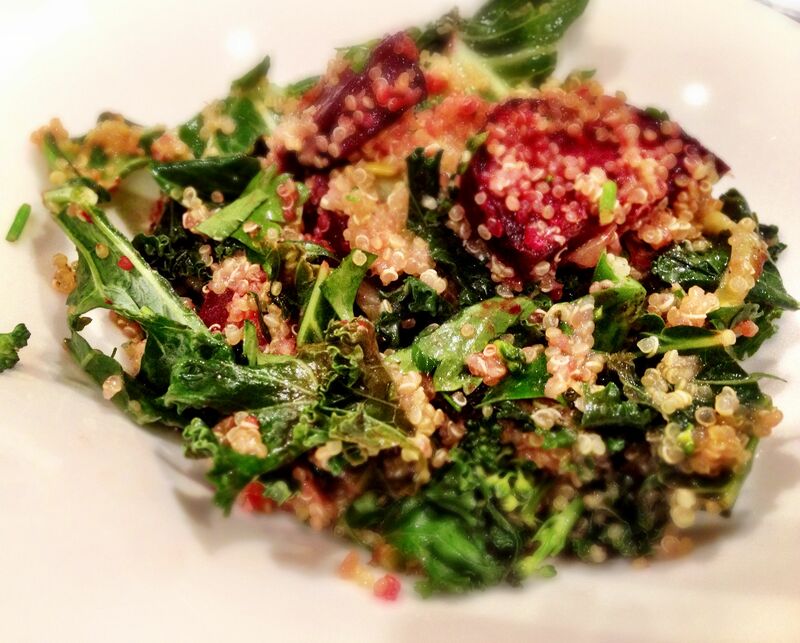 The dish contains beetroot, kale, broccoli tips, leeks, lemons and onion – and of course quinoa. Kale is amazingly dark and is apparently also a superfood – so I guess I’ll always be substituting it for greens or cabbage in future dishes. There’s a whole array of nutrients in kale – but I won’t bore you with that. It’s supposed to have some bee pollen on it – but mine has mysteriously gone missing from my Amazon delivery – so it ended up being a vegan dish. It was also supposed to have mint but we seemed to have run out. When you eat it there are an explosion of flavours and textures in your mouth. The kale and the broccoli is still crunchy, the beetroots are rich and there is a lovely citrus lemon running through it too. It also has a vinegary sour taste that comes from the mirin and the brown rice vinegar. It all comes together beautifully. This dish is a definite keeper. I’ll be making this regularly. It keeps well too – I had some leftovers today (cold) and it was still as yummy as last night – although the kale and broccoli had gone a bit soft. You could probably keep the dressing separate to the dry ingredients and throw them together at the last minute if you want it for work lunch the next day. This entry was posted in Honestly Healthy for Life, Natasha Corrett & Vicki Edgson, Vegan, Vegetarian, Want to make again and tagged beetroot, food, kale, quinoa, recipe, vegan, vegetarian by tenuoustoaster. Bookmark the permalink.